The sights, the sounds, the culture, the people, the vibes!! Ahh… it can only be Jamaica! Jamaica is approximately 4,442 square miles yet only 150 miles long by 50 miles wide at its widest point. It is the third largest island in the Caribbean, behind Cuba and Hispaniola. Despite its relatively small size, Jamaica continues to be one of the top travel destinations in the Caribbean. Different than some of the other Caribbean islands, such as Aruba, Bonaire and the Turks and Caicos, Jamaica is very lush and mountainous with over half of the island having elevation levels higher than 1,000 feet. The highest point on the island is Blue Mountain Peak at 7,402 feet. The Blue Mountain region of Jamaica is known for its coffee. There is something special about the elevation, the climate and the soil of this area that allows it to produce some of the world’s best tasting coffee. The temperatures in the Blue Mountains differ greatly from the warm beaches of Jamaica, with temperatures sometimes as low as the 40’s. With all this great coffee being produced on the island, the irony is that very few Jamaicans actually drink coffee. Jamaica is not entirely known for its scuba diving, although it is still one of the favorite destinations for divers in the Caribbean. Many beginners earn their PADI diving certifications every year in Jamaica. Divers just love scuba diving Jamaica. It’s largely in part due to Jamaica continually being a top travel destination in the Caribbean year after year after year. In addition to the facts, top side activities on the island are second to none and that’s part of what makes Jamaica so special. Travel and tourism account for about 90% of the Jamaican economy and it’s no surprise that Jamaica is home to some of the best all-inclusive resorts in the Caribbean. Many world class dive operators call Jamaica their home. Diving at Sandals, Beaches or RUI all-inclusive resorts are sure to be some of the best scuba diving experiences and memories you can get. Anytime you can get under the water and experience the wonderful world of marine life, you should take advantage of it. Scuba dive, but more importantly; scuba dive Jamaica! It may be difficult to choose just one area to visit during a trip to Jamaica, since each side of the island is unique in its own right. Why? Because Jamaica’s popularity is huge! Come see for yourself what makes Jamaica so great. Remember, as they say about Jamaica… Once you go, then you know! Whatever you do… Keep on diving! Depending on where you are, Jamaica is a fairly close travel destination for scuba diving adventures. Located just 600 miles South of Miami and only 90 miles South of Cuba. Jamaica is an easy 2 hour plane ride from Miami International Airport. Be sure to check out our interactive map of Jamaica, including the main tourist areas such as Montego Bay, Negril, Ocho Rios and Port Antonio as well as Jamaica’s most popular scuba dive sites. 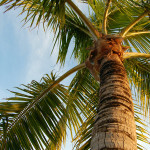 The popularity of Jamaica has become huge and it continues to be one of the top travel destinations in the Caribbean. Because of this, airfare to Jamaica is relatively affordable. 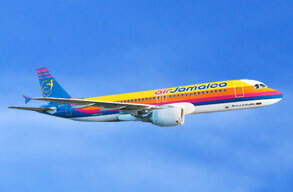 As a popular destination with tourists, there are many airlines to choose from when traveling to Jamaica. Most offer direct flights to Montego Bay Sangster International Airport. To see which airlines fly direct to Jamaica, general travel information about the airports and flights, along with other details, please visit our page about flights to Jamaica. 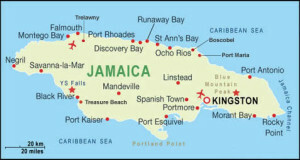 The 2 main international airports in Jamaica are located in Kingston and Montego Bay. Mid-December through mid-April is the peak season for visitors booking flights to Jamaica, and reservations need to be made a couple months in advance to secure your best pricing. This season is especially busy at Carnival, which is March and April in Kingston, Montego Bay, and Ocho Rios, and May in Negril. Jamaica being a very popular cruise ship destination, Montego Bay, Falmouth and Ocho Rios are the primary cruise ship ports on the island and can get somewhat busy during Jamaica’s cruise season. Mid-April to mid-December sees rates cut by 20 to 50 per cent. However, it does get busy around the time of Reggae Sumfest, usually in late July or early August, and the annual Marlin Fishing Tournament held every October in Ocho Rios and Port Antonio. Tourism in Jamaica is huge. And one thing is for sure, they’ve got plenty of hotels. From boutique type accommodations to luxury all-inclusive resorts, there are hotels in every price range. If you’re looking for getting the best travel deals to Jamaica, be sure to check out our page on hotels and resorts in Jamaica. All the best beaches and the main tourism areas, Montego Bay, Negril and Ocho Rios, are located on the North and West sides of the island. 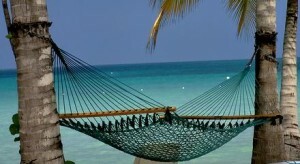 Jamaica makes for a good vacation spot, in part, due to having some of the most beautiful beaches in the Caribbean. Whether you like scuba diving in Jamaica or not, you are sure to find a hotel that will suit your Jamaica vacation needs. To read my travel reviews about the hotels and resorts I’ve stayed in while visiting Jamaica, be sure to visit our page on hotel and resort reviews in Jamaica. At Sandals and Beaches all-inclusive resorts, scuba diving Jamaica is already included in the price. Be sure to take advantage of that if you ever stay at one. You can do a resort certification course for free or pay additional funds and get yourself certified as a PADI Open Water scuba diver. I did almost all of my specialized scuba diver training at Sandals resort in Negril, Jamaica. I have a timeshare there and it really cost me very little to do while already being there on vacation. I had access to the best dive gear and equipment, excellent and experienced scuba dive instructors and a top notch dive environment to diligently study, learn and train all about scuba diving. Jamaica maintains a fairly constant temperature year round, with the average temperature in the high 70’s / low 80’s F during the winter months and reaching closer to 88-90 F during the summertime. Temperatures generally fall approximately 10 degrees F during the night. Jamaica’s Blue Mountains, however, can get much cooler with 35-45 degrees F not unheard of. So, depending on your itinerary and travel plans, be sure to dress accordingly. The average rainfall per year in Jamaica is about 80 inches. It varies considerably over the island with the mountainous areas receiving close to 300 inches each year while sections of the Southwestern island seeing sometimes only 30 inches or less. The rainiest months in Jamaica are usually May / June and also October – December. Being in the hurricane belt, Jamaica experiences hurricane season from June 1 through November 30. The most active months for hurricanes in Jamaica are usually August and September. The water temperature in Jamaica averages between 78-80 F during the winter and 80-84 in the summer. With these temps, a skin suit is usually sufficient when scuba diving Jamaica in the summer. During winter months, you may want to try wearing a 3mm shorty suit. If you tend to get cold, you may want to consider wearing a full wetsuit. I personally haven’t ever used anything more than a skin suit when scuba diving in Jamaica. The water is usually very comfortable for me, regardless of the depths I generally visit, 65-90 feet. Visibility in Jamaica usually averages around 75-100 feet. It is not uncommon when scuba diving Jamaica to see well over 100 feet on certain days, especially when diving in Negril. Scuba diving in Jamaica is mostly done on the North and West coasts of the island, which also happen to be the most popular tourist areas. Jamaica underwater reefs have been overfished and as a result, the marine life is not as abundant as it was years ago. Jamaica is making efforts to restore the health of its reefs and marine life. The Montego Bay Marine Park was established in 1990 and the Negril Marine Park was later established in 1998. 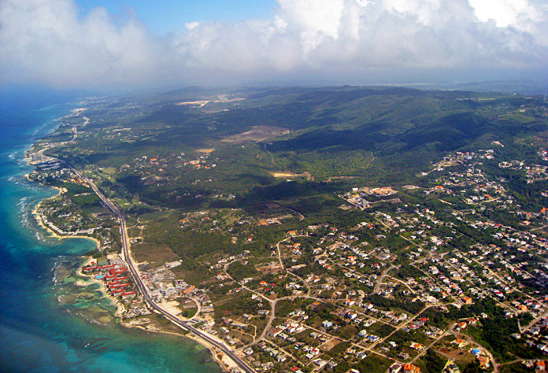 The Montego Bay Marine Park covers the entire Montego Bay and spans just over 15 square km. It extends from the high-tide mark to the 100 meter sea depth. 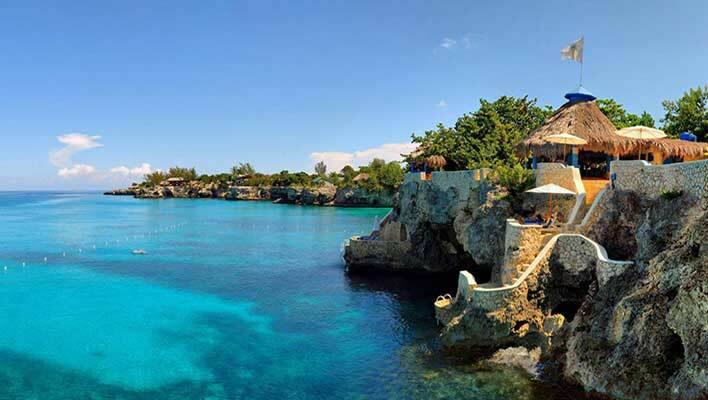 The Negril Marine Park covers 160 square km. and runs from the high water mark to approximately two miles (3.2 km.) out to sea. In addition to other regulations put in place due to this, you are no longer allowed to harvest coral and you may not wear gloves while diving in the marine parks. There are now laws in place to protect the sea turtles around Jamaica in addition to creating fish replenishment zones which are now marked by zone buoys within the parks. The Cayman Trench is located off of Jamaica’s North coast which causes the ocean floor to drop to over some 3000 feet depths. There are lots of wall dives on the Northern side of the island because of this. Negril, which is located on the Western side of the island, is more protected from the winds and ocean currents than Montego Bay and Ocho Rios, both on the North coast. There is an abundance of great diving sites all around the island, but the most popular dive sites are situated near Negril and Montego Bay. Check out our Jamaica dive site map to see a listing of all the current and frequented areas to dive near these spots. 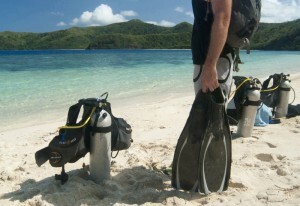 For specialized scuba diver training and unique dives, you may want to venture off to the Blue Lagoon or Port Royal areas. Diving in Ocho Rios or Port Antonio areas require more caution and underwater awareness as the waters are rougher and the currents are stronger. Drift diving is common here as the currents flow more in these areas than in Negril. I’ve experienced more wall dives and bigger drop offs on the North side of the island, between Ocho Rios and Port Antonio. Negril has always been known as having more abundant marine life and better overall diving than Montego Bay or Ocho Rios. The underwater reefs are simply in better condition. You’ll enjoy your dives regardless as the underwater world when scuba diving Jamaica is simply beautiful. In addition to some spectacular wall dives, reef dives and drift dives, Jamaica also has some cool wreck dives that get good reviews from people that scuba dive Jamaica. 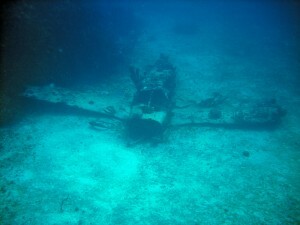 There are crashed planes in Negril, sunken vessels in Montego Bay and other unique diving experiences around the island. The conservation steps that Jamaica is taking with its reefs will assure that marine life continues to thrive and grow for years to come. Scuba diving Jamaica can only benefit from these reef conservation efforts. From traveling and diving there for the last 2 decades I can say it appears to be working. Besides having some of the best scuba diving in the Caribbean, the most popular top-side attraction in Jamaica has to be the beaches. From Negril’s famous 7-mile beach on the West end of the island to Boston Beach and Frenchman’s Cove in Eastern Port Antonio, you will experience some of the best beaches in the Caribbean! You’re going to love it! Jamaica has so much going for it activity wise, that you won’t be disappointed. From simple lounging on the beach catching a tan to zip lining through some of the most luscious jungle canopies in Jamaica, you’ll find everything that you can image possible to suit your style of vacationing. There are beautiful endless beaches, great Reggae music, fantastic Jamaican foods, breath taking waterfalls, lush green mountains and awesome people. As they say… Once you go, then you know! Besides the beaches, which are Jamaica’s top attraction, there are many other hugely popular places on the island to visit. 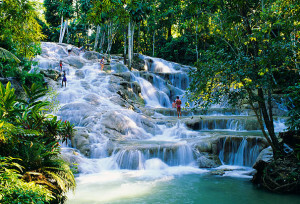 On the North side of the island, one of the more popular spots to visit, near Ocho Rios, is Dunn’s River Falls. It’s a huge cascading waterfall that flows down through many pools and waterfalls on its way into the Caribbean. You are allowed to climb these falls with or without a guide. I highly recommend a guide to assist you with where to climb and where to place your feet. This is one of the most popular attractions in Jamaica, especially for the cruise ships. 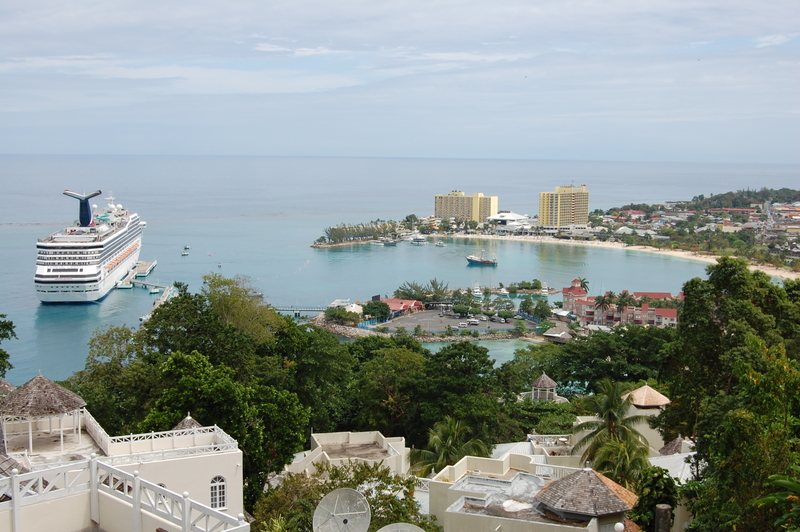 I’d recommend going on a day or time when the cruise ships are not in Ocho Rios or Falmouth ports. Other popular places in Jamaica that are special to see are listed below. Visit our Jamaican tours and excursions page for a full list of all things to do while in Jamaica. If you’ve got any questions, feel free to contact me and I hope that my Jamaica travel planning website helps you out in planning your next scuba dive trip to the lovely island of Jamaica! Overall, Jamaica is a great vacation destination. A great dive destination and always a great trip anyway you look at it. Remember, when in Jamaica, be sure to scuba dive Jamaica!